Trades between 100 and 200 hour MA below. The EURUSD moved to a new session low with general dollar buying on Williams comments. 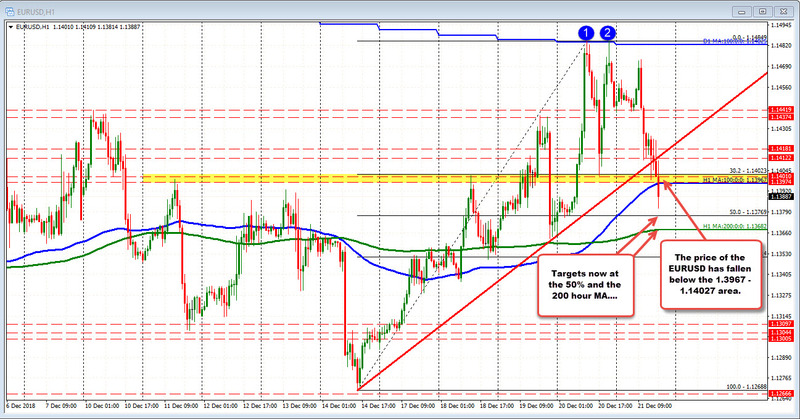 The move lower has taken the price below the 1.1400 area, the 38.2% at 1.14023 and the rising 100 hour MA at 1.13967. Stay below those levels will keep the sellers in control. Yesterday and earlier today, those levels stalled falls. The 50% of the move up from last week's lows at 1.13769 and the 200 hour MAQ at 1.13682 are targets now on the downside. On Wednesday this week, the price bottomed against that MA before moving higher (and to the 100 day MA) yesterday.